I am not one of those fans who can say I grew up with Harry, because I didn't. Not really. When Harry Potter and the Philosopher's Stone was first published, I was 14, but it wasn't until the age of 18 that Harry and I finally met. I was in my final year of high school, and my schedule at the time allowed for plenty of "spare" periods which I tended to spend in the library (big surprise) where I'd study and complete homework. More often than not, I'd find myself browsing in the fiction section of our school library, especially when I was meant to be completing my Algebra & Geometry homework. I was a good student, but AlGeo was my Achilles' heel and so I often spent my time reading instead of toiling away when it came up in my work pile. As I stared off into space wondering about imaginary numbers, vectors, and polar space, a paperback version of Philosopher's Stone caught my eye on one of the fiction spinners. By this time there was enough buzz about the series that I had actually heard of it and knew it was supposed to be really good. So I decided that I would give it a try and see what all the fuss was about. I read the first chapter at school and thought it was fine, but I certainly wasn't hooked. Still, I read on, and as I turned the pages of Chapter 5 (Diagon Alley), the magic began to take over. I've written before about how I am a total geek when it comes to school shopping and stationary, so experiencing Harry shopping for his Hogwart's school supplies really gave me a thrill and finally made me feel like I was entering a really wonderful world. By the end of Chapter 10 (Hallowe'en), I was well and truly under the spell of this children's book... To this day, I still can't read Philosopher's Stone without tearing up (sometimes rather dramatically) when I reach the end of the chapter, when Harry, Ron & Hermione have triumphed over the troll in the girls' bathroom, forever cementing their friendship. I just really really love the line the caps the chapter off that reads: "There are some things you can't share without ending up liking each other, and knocking out a twelve-foot mountain troll is one of them." Ain't that the truth! I rushed through Philosopher's Stone at breakneck speed and then felt myself desperate to read the next book. I actually drove to a bookstore that night so that I could start reading Chamber of Secrets straight away, but wound up buying the first three books in a boxed set off of a seller on eBay and book four at Sam's Club. I was so desperate to get my hands on the books that I actually asked if I could drive to his home in Toronto (where I was living) to pick them up rather than having to wait for Canada Post. He agreed, and I soon blazed through the first four books in the series. By Goblet of Fire, I was in full-blown Potter addiction. I stayed up late into the night, reading until about 3 in the morning in order to finish it, weeping gratuitously as I did. To this day GoF is probably my favorite Harry Potter book, in part because I think it's the turning point in the series where things really begin to get dark, and Rowling manages to strike a fantastic balance between emotional moments and humour. Yes, it's true. We scheduled a 7-week backpacking trip around the release of HP6! 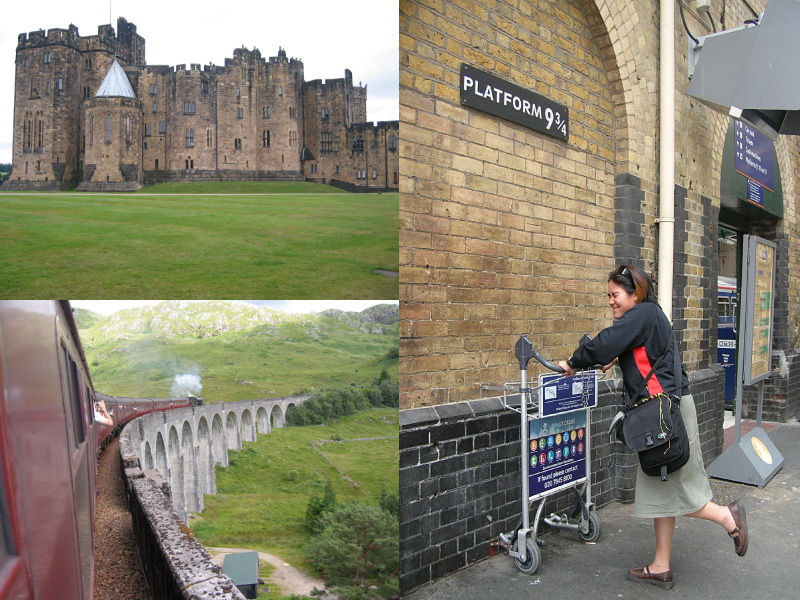 Hogwarts, Hogwarts Express, Platform 9 3/4! All to say that I'm a pretty huge Potterphile. So it was with a mix of excitement and trepidation that I approached the midnight showing of the final movie in this truly epic series. I've been following Harry & co. for a decade at this point. Ten years is a long time, and I admit, part of me just simply wasn't (isn't?) ready to let this franchise go. Still, I had to be there to see the series through to its conclusion, even if it did mean being up until 3am on a "school night" (brings back memories!). And I wasn't the only one, since myself and a group of friends wound up in a theater where every single one of its 27 screens were showing Harry Potter, and there were over 4000 people in attendance for this momentous event! As for the film itself, I think I'm still processing it, to be honest! I have so many feelings and emotions wrapped up in this series, I feel like a single viewing just isn't sufficient to parse such a huge film. I do think this final movie will be better appreciated and enjoyed when it can be watched seamlessly following Deathly Hallows: Part One (there was a funny moment when Harry refers to the events of "the previous night at Malfoy Manor", which was more than six months ago for the audience!). And while we fans finally get our epic battle that so many of the other films have missed out on (I'm still steaming about the last 30 minutes of the Order of the Phoenix film! ), even that felt rushed in some senses. I think it's always been a challenge for the films to capture the depth, scope and richness of the books, and it's certainly been interesting to watch them evolve over time from being nearly carbon-copy replicas of the books to truly aiming to stay true to the stories but using the films to add other dimensions to the tales that readers know so well. I can say whole-heartedly that I love these books and I love these films, even though they do not overlap perfectly, and I am able to enjoy each medium relatively independently of the other. So, what it comes down to is that ten years later, and I'm still not ready to say goodbye to Harry. As Tony reminds me, I still have procuring the films on BluRay to look forward to (I'm sure a fancy schmancy set will be out in time for Xmas! ), as well as a trip to Harry Potter world in Orlando, Florida. And while I'm still pretty much in the dark as to what exactly Pottermore will provide us above and beyond audio- and ebooks, I have high hopes that I won't be let down. But October is a long way away, and in the meantime, I think it's time I go back to the very beginning and reread this series once more. Because that's the wonderful thing about a good book, isn't it? Their magic never runs thin, and years worth of adventures are right there waiting to be experienced afresh. If the Harry Potter books taught us anything, it's that a life without love is not a life worth living. It's been my experience that with a good book on hand, one can fall in love many times in a single reading, each time deeper and more satisfying than the last. So if you don't mind, I'll hold off on saying goodbye to Harry Potter, and instead prepare myself to say hello all over again. What a fantastic tribute post. I love the last bit in particular, because it’s true that while there isn’t anything left to wait for, we can always return to the books in particular. I am determined to reread them soon and experience that magic again – and I’m so glad it will never go away. Say hello again, indeed! I love this. We’re going to see the movie this weekend and though I feel fairly bittersweet about the whole thing, I finished the books a while ago and think of the movies as a bit of an afterthought. Loved reading your story! In some ways, I really wish I had been able to go to a midnight book release or a midnight movie, and I definitely wish I had been around in Potterworld since the beginning, rather than right after HBP came out. Still, even six years of books and movies for me was an amazing trip. And oh I love seeing your UK pictures! I didn’t realize you could go to the castle and express! This is so great. I love the photos and the story. I was disappointed with Order of the Phoenix as well (SUCH a great ending foreshortened). I am still processing the film as well and plan to see it again soon. I went straight to the library to check out the books (I own them all but have lent them out). I am glad that you mentioned that you still have Orlando and Potter World to look forward to, as perhaps when you come down, we can go together! I also am saddened by the end of the Potter era. My kids grew up with these books, and we have read them all together, and seen all the movies together as well. I also love that you mention that we can love them all again and again, and relive the magic as many times as we want to. It’s still sad to say goodbye though. @ Pam: I have always really enjoyed the movies, but it has been an ever-evolving process. Initially I was scandalized when they started to depart from the books circa HP3, but I’ve come to appreciate the fact that they can be faithful while providing a slightly different slant on what was written on the page. @ jenn: True story: When Tony and I went to see OotP, we were so disappointed with the film (although to be fair, HP5 has also always been my least favorite of the books), and the one part we were so looking forward to was the throwdown in the Ministry of Magic when Harry and the gang are trying to find the Hall of Prophecy. And then all of a sudden, instead of running through all the weird/cool rooms, the gang is already there! And Tony blurted out:”You’ve gotta be kidding me!? !”, which was maybe my favorite part of the whole thing. Soooooo let down! 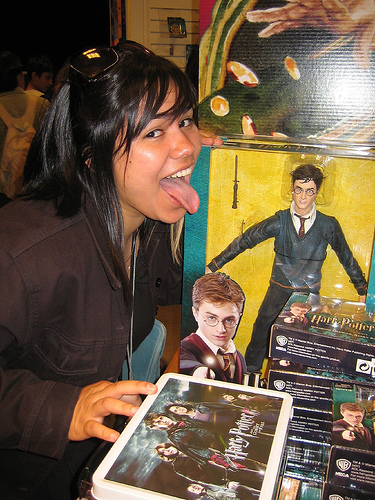 @ zibilee: Dude, I am so excited to go to HP world some day! I am a big fan of the Orlando theme parks in general, but Universal Studios/Islands of Adventure have always been my favorite, so I’m really excited that that’s where they decided to put Potter World! I am thinking we might come down when I finally graduate from grad school… but I will certainly keep you posted! @ Nadia: I have re-read many of the HP books several times (I think I’ve read HP1 at least 5 or 6 times) and they never fail to excite and delight me! The magic is always there, so I’m really excited to revisit them again! @ Annabel: I am actually quite surprised that I DIDN’T cry this time, because I am fairly certain this is the first time I’ve not cried during a Harry Potter film! That said, I may have just been in shock that the final movie is actually here. I plan to see it a few more times in theaters and I am suspecting that I’ll weep during at least one of those viewings! We saw the film this afternoon… Loved it, I even shed a tear when ***** died. Many complained about the coda when the last book came out, but funnily enough I thought it really helped the film to finish on a high – handing on to the next generation after the grimness of the rest. Although I started reading the books as an adult I’ve loved them all the way through. I’ve registered my interest for Pottermore too. Lovely post. It is a series that will live on for many of us who will reread and continue to enjoy the movies. It is nice that your love of the series has remained steady through all the years. My son, who is now 17, was enamored of the books when he was a little boy. Now he is interested in seeing the movie but more interested in chasing the girls. Hopefully he will come back to it someday! My friends and I all started reading this as adults (while we were all studying for our doctorates) and we’re all still in love with the books and movies. My two little nephews are getting obsessed with it now so I’ve given my hardback vols 4-7 to them (I did have a panicky moment but I think I love my nephews a little more than HP!) I haven’t seen the latest film yet, but I’m planning to go with my friends. Can’t wait! Brilliant post! ps: Will definitely visit the castle, express, and the station later! I went to see it the other night with my teenage daughters and their friend. We were all a bit tearful at the end. Like you, I’m still processing it. It was my first 3D movie and I can’t see that it made much difference. Loved the photo of you at Kings Cross! Wonderful post, Steph! Loved the pictures that you have posted too. @ Kathleen: My brother sounds a lot like your son, though a bit older! I managed to get him to read the first four books when they came out after I had devoured them, and they are the last books that I can honestly remember him sitting down and making time to read… But he lost interest after HP4, perhaps due to the long wait between it and HP5, and didn’t keep up with the series. I have high hopes he’ll come back to them one day though! @ Nicola: I have never been a hug fan of 3D films, though I think they can be successful when the film in question is straight animation. Tony and I saw Avatar in 3D and it actually gave me a headache! We saw this in regular 2D, which I think was good for a first viewing. I know I will check it out in 3D before it leaves theaters just for the experience of it, but honestly I’m ok with it in just 2D! 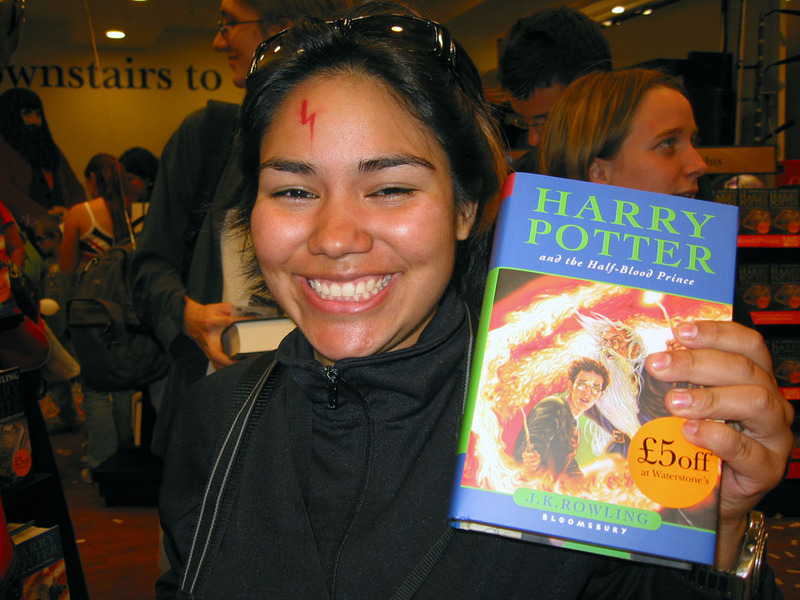 Eleven years of Potter-mania – that’s been my life. I was in the hospital, for about two weeks when I was fifteen, with no real good books at hand, as it was all very rushed and unexpected. Someone got me a Leon Uris (and it was terrible. Never do that to a fifteen year old who is bed-ridden and in enormous amounts of pain) and someone far nicer got me the first three books of Harry Potter, which I read in less than a week. Withdrawal symptoms took over, and I wanted the rest of the series. I needed to know how it ended. Till date, Prisoner of Azkaban remains my favourite, with GoF coming a close second, and OOTP being my least favourite. Hopefully, Pottermore will give you something new as you prepare to say hello all over again, and re-start the wonderful journey. Love the post, and can relate to so many bits and bobs (other than chickening out and ordering the books on Amazon as opposed to queueing up). I visited Harry Potter world the week the last film was released and watched it at Universal after spending the day being immersed in the magic that is Hogwarts and Hogsmeade. It made me quite emotional during the film although I loved whispering to Gareth, “we’ve drank that” when Aberforth gives them Butterbeer and recognising the building I work in in the London skyline scene after the Gringotts escape! Such an experience and the perfect way for me to watch the final movie. Please write that UK tourist post you’ve alluded to in comments and I’ll share my photographs in return. Wonderfully nostalgic and evocative post. I have just read your HP blog to my 9 year old son who is obsessed with HP. He is half way through HP7 and has watched all the movies, with the last being seen on the big screen. And he has done all of this within the last year. He loved your blog, as did I, and I think it helps budding readers to see adults loving kids books. Unfortunately, I am only half way through the series, but do plan on rectifying this some time soon. If only I could get to the bottom of my TBR pile, but it keeps growing bigger as a result of reading such great blogs as yours.